After recovering from multiple injuries, fit-again Carolina Marin focuses on rebuilding her lost form for the upcoming cramped season. Olympic and World Championship silver medallist PV Sindhu said she was excited at the prospect of playing Premier Badminton League (PBL) matches in Chennai. While PV Sindhu left her mark on world badminton in 2017, Saina Nehwal also came close to full fitness after the knee injury she sustained during the Rio Olympics. It was not without reason that the normally stoic countenance of Sindhu reflected the pain of the heartbreak she had been repeatedly suffering over the past 16 months. Catch all the live updates and scores from the final day of the Superseries Finals as PV Sindhu faces Akane Yamaguchi and Lee Chong Wei takes on Viktor Axelsen. 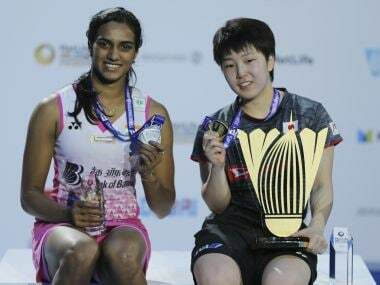 Despite beating Akane Yamaguchi convincingly in the group stages, PV Sindhu says she will have to fight for each point in the final of the Dubai World Superseries Finals. Chen Yufei could not read the pace, angle and direction of Sindhu’s smashes when the shuttle failed to cross the inner line at the back of the court (used in the doubles service). Both Lee Chong Wei and Son Wan Ho qualified for the men’s singles semi-finals of the year-ending Dubai World Superseries Finals, leaving Hong Kong’s Ng Ka Long Angus gnashing his teeth in despair. PV Sindhu powered to a one-sided 21-9, 21-13 triumph in a mere 36 minutes over the other unbeaten player in the pool, top-seeded Akane Yamaguchi.